Our tech-savvy, consumer-based culture relies heavily on flexible, simple, accessible payment options when making purchases and obtaining services. One of these solutions is payment by telephone - a process that typically involves calling a customer service department and relaying important and valuable personal information to a live agent. Any business that processes payments over the telephone is required to maintain PCI compliance, which ensures that all transactions are secure and that consumer data is safe-guarded and remains invulnerable. Unfortunately, many businesses which utilize live-agents to process payments are falling short of this mandate and are not meeting appropriate security requirements, as it is expensive and can be difficult to implement. An Automated Pay-By-Phone Payment system solves this problem. Automated Pay-By-Phone Payment processing (which use Interactive Voice Response, IVR, technology) is a system which allows users to make credit card payments securely over the telephone. It employs leading-edge technology, offering consumers both ease-of-use and peace-of-mind. 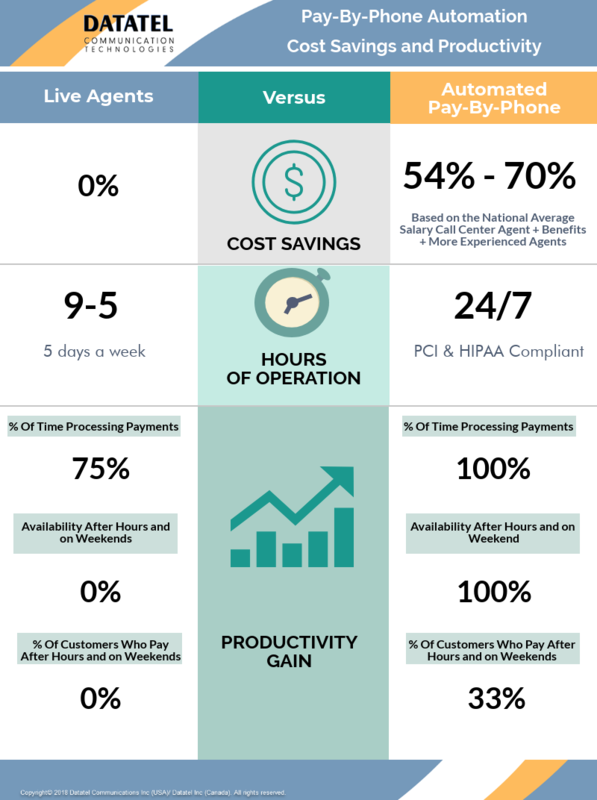 Not only do Automated Pay-By-Phone Payments address PCI compliance requirements, but they reduce work load by hundreds of hours and save organizations and businesses thousands of dollars a year. Industry accepted metrics calculate the average telephone payment call time to be 3.5 minutes. For an organization processing 1,000 payments a month, this translates into 3,500 minutes every month, or 700 hours a year processing payments from customers. A larger organization that processes 3,000 payments a month spends over 2100 hours employee hours a year. Automating this process significantly reduces the number of hours required maintain up-to-date billing and processing payments. An additional consideration is the challenge of call concurrency, and how to manage customers who wish to transact after hours and on the weekend. When multiple calls come in simultaneously, resources are stretched and the ability to respond in a timely and efficient manner is significantly diminished. Moreover, the inability for customers to pay their bills during evenings and weekend hours, often results in past due accounts, costing businesses hours of time managing overdue statements. Automated Pay-By-Phone Payment solutions alleviates this problem, and allows consumers to conveniently pay invoices 24/7. There are various methods of calculating agent cost and cost savings that Pay-By-Phone automation can bring to your organization. We kept it simple for this analysis. Our Commitment to your Success starts long before your Partnership with Datatel begins. Our Specialists are here to help you with any of your inquiries or requests. 20 Years ago we launched Datatel with the vision to deliver innovative software and voice communication solutions to help our clients become more agile, profitable and successful. Our success comes from investing in our people, our clients and technology. With a focus on innovation we have arrived to a service delivery model that guarantees our customers satisfaction. Copyright© 1996 - 2000 Datatel Communications Inc (USA)/ Datatel Inc (Canada). All rights reserved.